Exfoliation corrosion morphology inside a water pipeline. In most cases of corrosion, including uniform corrosion, the grain boundaries behave in essentially the same way as the grains themselves. However, in certain conditions, the grain boundaries can undergo marked localized attack while the rest of the material remains unaffected. The alloy disintegrates and loses its mechanical properties. This type of corrosion is due either to the presence of impurities in the boundaries, or to local enrichment or depletion of one or more alloying elements. For example, small quantities of iron in aluminium or titanium (metals in which iron has a low solubility), segregate to the grain boundaries where they can induce intergranular corrosion. Certain precipitate phases (e.g. Mg5Al8, Mg2Si, MgZn2, MnAl6, etc.) are also known to cause or enhance intergranular attack of high strength aluminium alloys, particularly in chloride-rich media. The exfoliation corrosion phenomenon observed in rolled aluminium alloys is usually, but not always, intergranular in nature. 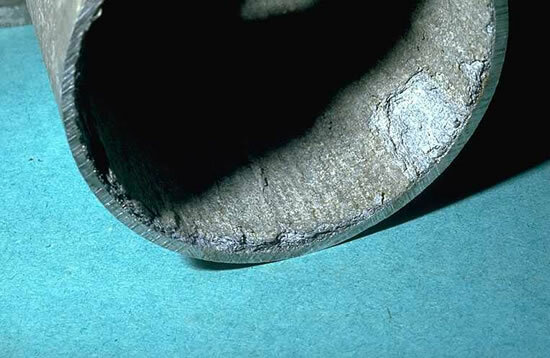 In this case, the corrosion products occupy a larger volume than the metal "consumed", generating a high pressure on the slivers of uncorroded metal, leading to the formation of blisters. Numerous alloy types can undergo intergranular attack, but the most important practical example is the intergranular corrosion of austenitic stainless steels, related to chromium depletion in the vicinity of the boundaries, due to the intergranular precipitation of chromium carbides (Cr23C6), during a "sensitizing" heat treatment or thermal cycle.